We signed up for the Verizon mifi jetpack through FMCA because when you reach you "unlimited" data limit, you don't get cut back to 3g for the remainder of you billing cycle. Well, we reached 25gb of data and low and behold, for 3 days now, even in the middle of nowhere, TX, I can't get webpages to load, email to download and forget trying to watch video. This all worked beautifully before hitting the soft data limit. Verizon said it is due to network congestion on the tower. I find that hard to accept after 3 days and at all times of day or night. Is anybody else experiencing this with their jetpack? The FMCA agreement is for deprioritization, not throttled back for entire remaining billing cycle. I have the MiFi Jetpack. and when we got ours I kept my data plan with ATT&T for a couple of months. I then lowered it from 16 gb to 10 gb. When I hit 25 gb on the MiFi I just go to my hotspot. I have no issues with the Verizon MiFi until I reach 25 gb which isn't too often. I saved the price of the unit by lowering my data plan. From what I have heard it is the same with all Unlimited Data Plans. I have the Verizon Unlimited plan, mine is not with FMCA, but the so called cut back on my plan is at 22 gb, with 15 gb per hotspot. I have maxed out several times, and the cap on my plan is 70 kb until the month's end. Yep, it creeps and crawls, but the web pages will usually fill, if there is enough coffee left in the pot. I have been unable to get broadband at my home in the past, but fortunately ATT finally came through in mid January. Uverse is now putting through 5 mbps with a terabyte monthly gap, I doubt that will happen soon. My Verizon mifi will both down and upload at 30 to mbps before the data cap hits, so I am installing a load sharing router to get a fast enough speed to be able to stream if HD, and hoping that this will stop my Verizon Mifi from reaching it's data limit too soon each month in the future. If the FMCA Verizon Unlimited Plan is somehow different than their regular plan and this is true, then it is news to me. I thought if you were on the unlimited plan then each hotspot was throttled back to 3g speeds once you hit 15gigs on that device. Joe all of my devices continue at 4g until I reach 25gb. Then all are throttled back to 3g. Unfortunately, it is a hard throttle at 25gb despite our best efforts during negotiations with Verizon. Below is what is stated in the FAQs on the Verizon page on our website. Is there a data threshold? Yes, you will see decreased speeds upon 25GB of usage in a given billing cycle. Slowdown speeds will range between 70 kbps – 2.7 mbps. Normal 4G LTE speeds will resume at the beginning of the new billing cycle. If you have any other questions or concerns please don't hesitate to contact us. So how does the new FMCA SPRINT package compare..? Is Sprint really UNLIMITED use at FULL Speed.? It doesn't matter if Sprint is at full speed, the coverage is so poor across the country it doesn't work at all a lot of the time. My wife has Sprint and I have Verizon. I have used Verizon MiFi for several years with reasonably good luck. In a rural area mine works about 90% of the time and hers about 10% of the time. I had sprint before Verizon, never again Sprint, service was so poor that fertilizer would not help. I was lead to believe the throddling would be based on the amount of traffic after you hit 25G. Should have went with Tmobile or ATT.! Very unhappy, can't wait till my 2 years are up. What is happening? How do you know you're not in a high traffic area? Been in 3 states at all times day or night, speed test .07mps. Yes, you will see decreased speeds upon 25GB of usage in a given billing cycle. Slowdown speeds will range between 700kbps – 2.7 mbps. I have been with Verizon for several years, have never seen above 700 kbs after throttling begins, until of course the new bill cycle begins. I might add that I live within 300 yards of the Verizon tower and on the same mountain top, signal strength is 100%. If you were hoodwinked into the FMCA Verizon deal, the only bright spot is that 5g technology may be coming out soon. Last month when my Windows 10 updates chewed through 11 gigs in a day and I was throttled back about 6 days into the billing cycle I ended up on the phone with Verizon for about 45 minutes. They finally got me to one of their tech wizards that could actually see everything we had downloaded (with my permission) in order to determine how that much data was used when not steaming or downloading anything. Anyway, he mentioned that "when 5g technology was rolled out then 4g would become the technology that everyone would be rolled back to". I asked him when that was coming and he said they hadn't told anyone but he suspected sooner than later. As with American Pie, that'll be the "DAY-AY-AY". I’ve been doing a lot of checking on Verizon and sprint packages thru FMCA . 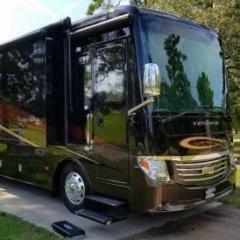 If, while RV’ing you stay near big cities sprint should be ok and I do like the , no contract . 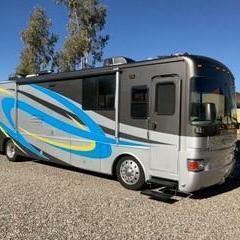 Unfortunately we Rv in places away from big cities. Verizon has better coverage in rural and coastal areas where we Rv a lot. $49.99 for 25g is ok sorta. Does anyone know what the total fees are including taxes and federal etc? Prior to this I was with AT&T and had 22g unlimited and had phones bundled for a ridiculus price of about $187.00 per month. 22g went quickly then throttled to a ridiculus speed. I switched to Tmobile . Phones are a reasonable price but the MIFI device is fairly lame. I currently pay $77.50 for , no contract and I get 22g and it is NOT unlimited. When it’s gone, it’s gone. I Do have 10 g tethered on each phone so that helps. So you want to check thoroughly before you jump to another carrier. None of them have the ideal setup. i will probably switch to one of the FMCA offered carriers because of the cost savings. Verizon is looking ok but I’m still checking. IF. you can get the FMCA deal. I have been trying to get an order through for the last week. 2 credit apps, 2 on line orders completed and accepted. Now they want driver license, utility bill and credit app faxed to them. 45+minutes on hold before talking to their fraud/verification dept. WAAAY to much trouble. Either Verizon or FMCA is not being honest about this so called deal...and from what I am reading here, not worth the trouble.